Talk about green gemstone rings for men and you will hear a few interesting things. Many people are under the impression that green gems are not suitable for men. This is quite interesting because men's rings with emerald and green jade, are some of the most demanded men's jewels. Tourmaline was far more popular around 5 to 6 years ago, that was when the gem was quite budget friendly. Jewelry buyers gradually became more aware of natural gems, they realized that green tourmaline had a number of attractive features. Designers innovated some tremendous designs, artisans crafted excellent tourmaline jewels. The price of this gem has never looked back after that, tourmaline for its beauty and toughness is fairly priced but, surely beyond the reach of many budgets. 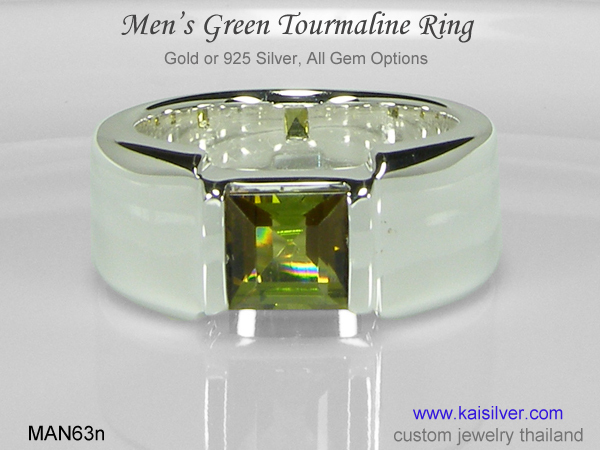 The MAN136 Men's Tourmaline Ring from Kaisilver is a tremendous jewel, it is sturdy, well crafted and set with a large green tourmaline gem. This is a high end custom ring for men, available in gold or 925 sterling silver. Irrespective of the metal that you choose, you can rest assured that the quality of craftsmanship and gemstone will not be compromised. Men love gems that have a deep saturated color, green tourmaline fits that description well. The majestic green of tourmaline is a color tone that will never seem outdated or out of style. The large 11x9mm oval green tourmaline gemstone is handpicked and custom cut by highly skilled gem cutters. The hefty metal weight might seem like an overdone luxury but, this feature plays a prominent role in creating this sturdy and durable jewel. Tourmaline is a tough stone and does not require any special handling caution, just remember that it is never a good idea to allow any jewel or gem to be struck by physical impact. The color of green tourmaline will look good in any metal color, the selection of gold or silver is entirely up to. The same team of designers, artisans and quality control experts handle the production of Kaisilver gold and 925 silver jewels. If you choose the gold option, you can choose from 14k or 18k and we can provide a price quote for a 10k ring if that is what you need. Most experts agree that 14k gold offers a good balance between metal hardness and gold content, you can pick what suits your preference. Another very interesting feature of gold is that, you get to choose yellow, white or pink gold. A men's tourmaline ring in any of these gold colors would be impressive, go by what looks good to you. You could wear this men's tourmaline ring for formal or informal occasions, the ring would also be perfect as a men's wedding ring. With Kaisilver's superior quality standards, you never need to segregate jewels as being suited for formal or informal wear. Customization: There is an important thing about Kaisilver jewelry that always works to your advantage. Since each jewel is completely made to order, you are not restricted to any specific design or gemstone. You could basically pick any ring from our web resources and request, for it to be made with a tourmaline gemstone. We maintain the same quality standards for silver and gold jewelry, the choice of metal is therefore entirely up to you. Your green gemstone tourmaline men's ring can also be made with your own design sketch or image. 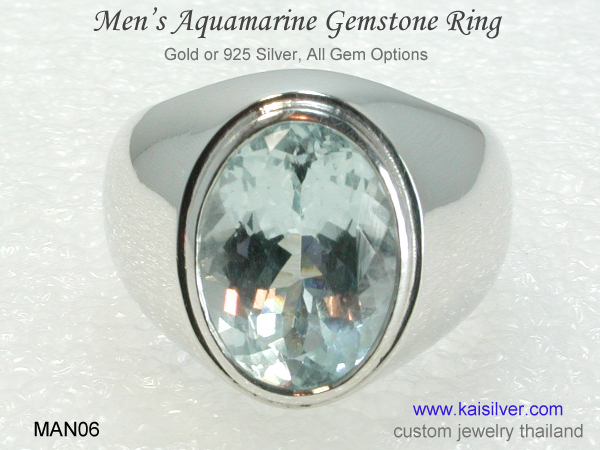 The Kaisilver complete Men's Green Gem Rings Report, will introduce you to some stunning jewels, you will also learn more about the green gem options available to you. Kaisilver: As the leading online provider of fine custom made jewelry, Kaisilver crafts all types of jewelry in gold or 925 silver. No limitation is placed on the selection of design or gemstone, jewelry can be also custom made with your own designs. Some of the finest jewelry artisans and gem cutters from Thailand work on all custom jewelry orders. Strict quality standards are maintained for both silver and gold jewelry. Backed by preferential access to more than 200 million carats of gems, we can procure and custom cut just about any gem on this planet. The support team at sales@kaisilver.com will be glad to reply to any queries that you might have.